Oculus Quest is a new standalone mobile VR headset with 6 degrees of freedom (6DOF) and two 6DOF motion controllers for $399. Field of view Oculus claims "similar to Rift"
Standalone VR headset: The Quest does not need to be connected to a PC or a phone. This means it is ready to be used right away. No need to power up your PC or launch Oculus Home or Steam VR. 6DOF tracking: Mobile VR headsets such as Gear VR and Oculus Go are typically limited to head tracking with 3 degrees of freedom. They can track head rotation but not lateral or vertical head movement. Oculus Quest can track with 6 degrees of freedom, which means that you can not only look in any direction but you can also move any direction. 6DOF tracking can create a much more convincing sense of presence, the illusion of feeling as if you are in another place. No external sensors: The Quest does not need any external sensors, so there’s nothing to setup. Instead, Quest uses Oculus Insight technology, which uses four cameras that can use computer vision to analyze the environment and track the Quest’s position in 3D space. Completely wireless: Desktop VR headsets such as Oculus Rift or HTC Vive or Playstation VR require a cable connection to a desktop system. The cable can interfere with gameplay and reduce immersion. Unlike desktop VR headsets, the Quest is completely untethered. Not only will you be able to move freely, but in addition, there is theoretically no limit to the tracking area. High resolution display: Oculus Quest has a display resolution of 1600 x 1440 per eye, 77% higher resolution compared to the Rift which has resolution of 1080 x 1200 per eye. Pixels on the Quest are much smaller and it can show finer details such as small text. Oculus Touch 6DOF controllers: Quest uses two Oculus Touch controllers that are each tracked with 6 degrees of freedom. These are the same controllers as for Rift S.
Built-in audio: Quest has speakers built into the headstrap, similar to Oculus Go, which sound like invisible earphones. Compatibility: Oculus has not yet said whether Quest will be compatible with the Gear VR / Oculus Go library. Journey of the Gods is an adventure game where you switch between playing as a warrior and as a god. Dance Central is a VR version of the dance game, with professionally choreographed moves. It will be available for both Oculus Quest and Rift. The video below shows the graphics from the Rift version. Here’s another Oculus Quest gameplay video with Shadow Point, a room-scale puzzle game featuring Sir Patrick Stewart. 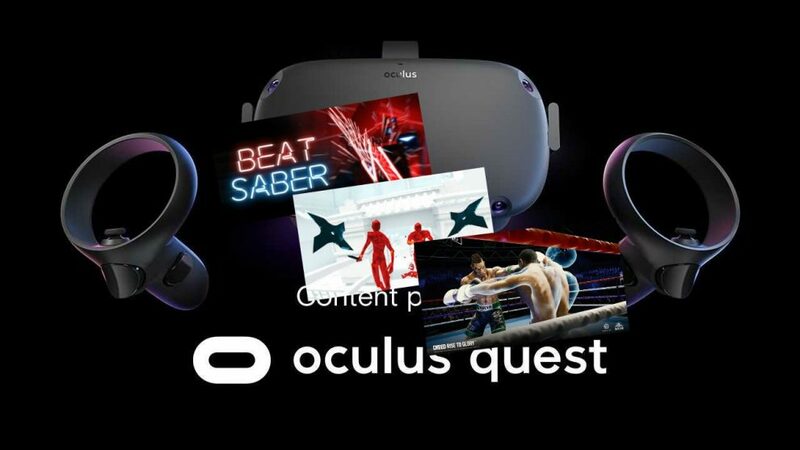 Many of the Quest games are ported from Oculus Rift. However, playing those games with a completely untethered headset can add a new dimension of gameplay. For example, with Beat Saber, it is possible for the player to spin freely. In Superhot, the player will be able to move in almost any direction (while avoiding real-world furniture). In Creed: Rise to Glory, with a large enough area, it is possible for the player to move around the ‘ring’ the same way they would in a normal boxing ring. With the Rift, that is difficult to do because the cable gets in the way. The tradeoff will be lower image quality compared to the Rift, but I believe the freedom of moving around should more than make up for it, in my opinion, for many games. Here is a comparison between Quest and Rift S image quality on Dead and Buried 2, courtesy of UploadVR. How does Oculus Quest compare to other 6DOF mobile VR headsets? Oculus Quest is not the first 6DOF mobile VR headset. There are also headsets such as the Lenovo Mirage Solo, which uses Google Daydream 2.0, and HTC’s Vive Focus and Vive Focus Plus. Qualcomm is also working on a 6DOF standalone VR headset. The Quest, Mirage Solo, Vive Focus, and Vive Focus Plus all use the same Snapdragon 835 processor, while Qualcomm’s VR headset uses Snapdragon 845 and features eye tracking. The Quest differs in two ways: first the Quest has two 6DOF motion controllers. Lenovo Mirage Solo and Vive Focus have a single 3DOF motion controller (similar to Google Daydream 1.0, Samsung Gear VR, or Oculus Go). Vive Focus Plus does have two 6DOF motion controllers. Qualcomm’s VR headset’s controllers have not yet been revealed. The other significant difference between the headsets is the software library. Among the 6DOF VR headests, Oculus is expected to have the largest libary of apps because Oculus has made it easy to port apps from Rift to Oculus Quest. Oculus is also screening games more carefully with the Quest, ensuring a higher quality standard than the games and apps for the other headsets. With Facebook’s backing, Oculus has also been able to invest hundreds of millions for VR software development. Oculus Quest will be available “Spring 2019” for $399 (64GB) or $499 (128GB). There is speculation that it will be released at F8 Developer Conference (April 30 – May 1, 2019) or soon thereafter. Will Insta360 One X videos play automatically on Quest?